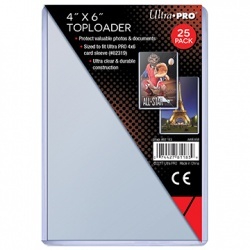 Rigid top and side loaders for postcards, photos, etc. This includes sizes between 3" x 5" and 6" x 9". CASE QUANTITY. 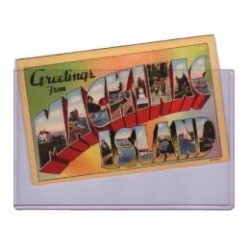 Holds standard-size vintage postcards. Approx. inside (usable) dimensions: 4-3/8" x 6-1/2"
Approx. outside dimensions: 4-1/2" x 6-13/16"
This is a case of 500 sleeves. If you are looking for a smaller quantity, see this item instead. 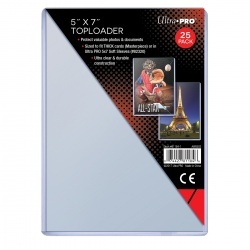 This is a case of 500 sleeves. If you are looking to purchase in packs of 25, see this item instead. Approx. inside (usable) dimensions: 5-5/16" x 7-3/8"
Approx. outside dimensions: 5-5/8" x 7-1/2"
This is a case of 500 sleeves. 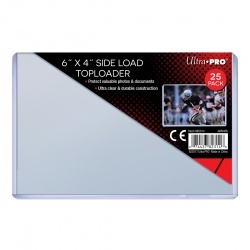 If you are looking to purchase in packs of 25 sleeves, see this item instead. Approx. outside dimensions: 6-1/8" x 3-7/8"
This is a case of 500 side loaders. If you are looking for individual packs of 25, see this item instead.